My new friend Tim Cooper has provided a marvelous new service. He has cataloged over 750 conversion stories — cataloged by what the converts were before they became Catholic. You can see this wealth of stories here. 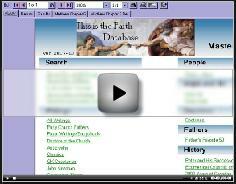 This is all part of his wonderful new website and Catholic database at This is the Faith. Check it out. By the way, I have his database loaded on my laptop and it is a ready icon when I need to look things up. By Mary Frances Schjonberg, November 26, 2007 — [Episcopal News Service] John B. Lipscomb, who recently retired as bishop of the Episcopal Diocese of Southwest Florida, has announced his intention to leave the Episcopal Church to join the Roman Catholic Church. In a November 20 letter, Lipscomb told the members of the diocese that he had written to Presiding Bishop Katharine Jefferts Schori asking to be released from his ordination vows and "the obligations and responsibilities of a member of the House of Bishops." Lipscomb wrote that he and his wife, Marcie, have been through "a long season of prayer and reflection" during which they "believe this is the leading of the Holy Spirit and God's call for us for the next chapter of our lives."